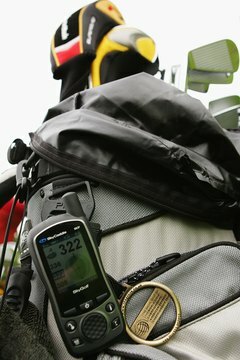 GPS devices may be used to measure golf holes. Measuring golf holes accurately is important for many reasons. Course officials require proper measurements so they can set the correct par for each hole. Players need accurate measurements so they can choose the proper club for each shot. Additionally, course ratings are based in part on each course’s yardage, so accurate information is required to set a proper rating and to establish accurate handicaps for golfers playing the course. A key question when measuring a golf hole is whether the measurement is taken in a straight line from one spot to the next, or if it follows the ground’s contours. The contour method was preferred for most holes in the early 20th century. Depending on a hole’s configuration, this method is sometimes more accurate than a line-of-sight measurement. If, for example, the ground on which the typical player hits his tee shot slopes downward toward the hole, the ball will roll farther than usual. In effect, the hole will play shorter than its actual yardage, if a line-of-sight measurement is employed. The opposite will be true if the ground slopes upward toward the hole. Conversely, if a short par-3 hole includes an undulating fairway, measuring the fairway’s contours is less accurate because the area doesn’t come into play for a typical golfer. By 1967 the United States Golf Association had mandated the line-of-sight method for measuring golf holes. At that time, steel tape was a viable measuring tool, along with surveying instruments. As of 2012, the USGA’s handicap manual requires that holes be measured horizontally with surveying instruments, an electric measuring device or a global positioning system. Accurate hole measurements must include consistent starting and end points. Pursuant to Section 12-1 of the USGA Handicap Manual, courses should maintain a permanent marker in each tee area, and measurements should begin from those points. The markers should be placed in the middle of each tee box. Also, because pin placements are changed regularly, each hole’s measurement concludes in the middle of the green. Measurements of dogleg holes typically follow the standard playing path. A measurement of a dogleg par 4, for example, will begin at the tee marker and advance to the middle of the fairway at the dogleg’s pivot point. A second measurement is then made from the pivot point to the center of the green and the two measurements are added. Section 12-2a of the Handicap Manual advises course officials to select a spot approximately 250 yards from the tee for men and 210 yards for women if a typical pivot point cannot be determined. How Is a Golf Handicap Figured on a 72 Par Course?